Not many people know this fact, but Porsche actually built a series of flamethrowers in the 1970s and 80s that were strangely shaped like 911 race cars. With each lift off the throttle pedal, a 935 will pop flames from the exhaust outlet. It's not what made the car successful in racing, but it sure didn't hurt. In fact, it's part of what makes the slope-nosed 911 silhouette racer with a big wing one of our favorite race cars of all time. A few European car spotting YouTubers, namely NM2255 Car HD Videos, 19Bozzy92, and Italiansupercarvideo, have collaborated to compile this mega Porsche 935 compilation video, and you absolutely need to watch it. There are at least five different 935s in this video, and a few of them are on track at the same time. Whatever vintage event was going on at Spa Francorchamps, it seems to have been a very good day for spotting 935s. 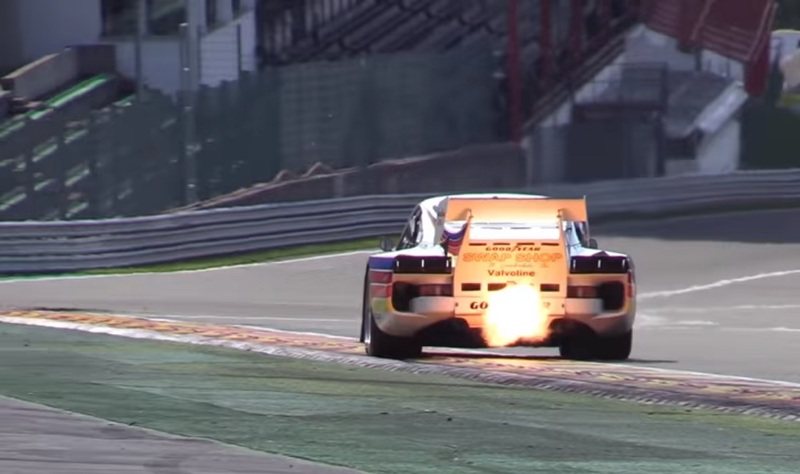 The best part about the 935 spitting flames on off-throttle events? You can instantly tell when a driver lifts going up Eau Rouge. "Ah, no sir, I don't think you took that corner flat, and we have video evidence." These drivers are wailing on these iconic vintage racing machines in a way that has earned our admiration. The only thing that might probably be better than watching a bunch of old 935s running wild around an iconic track like Spa? Driving one. I have no sound on my computer at the moment, but just watching the 935’s going round the track with the fire works gives me a buzz. What a sight it would be in the night. A few years ago will flag Marshalling at Winton Raceway in Victoria, Australia, a Club member Matt Stoupas had a blue early 911 a very quick car and driver, spun around in the pouring rain at the end of the back straight and stalled, trying to start it which took some time, engine, exhaust full of fuel when she light up it throw out two 6 foot flames which lit up the whole area, it just looked great i still can picture it today, watching the 935’s reminded me of that day, and we the Marshall’s were all soaked to the bone from the rain, i still had a good time. Just watching the clip again what beautiful cars the 935’s are.